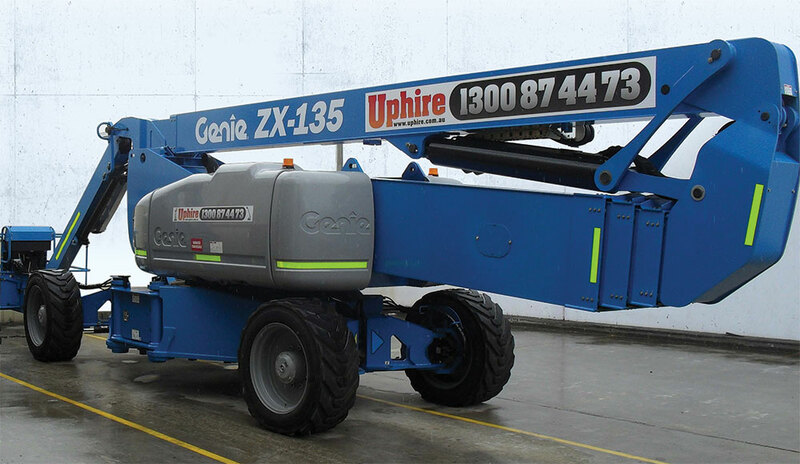 WHEN GENIE RELEASED THE NEW GENERATION GENIE® ZX™-135/70 boom lift, SYDNEY BASED HIRE COMPANY UPHIRE JUMPED AT THE OPPORT UNITY TO BE one of THE FIRST TO HAVE THIS MODEL IN THEIR FLEET. ACCORDING TO UPHIRE MANAGEMENT, THE ZX-135/70 IS A HIGH PERFORMANCE, TOP OF THE LINE BOOM LIFT. Since the Genie ZX-135/70 boom lift came into the Uphire fleet, it has been in constant demand. This unit has been out working in telecommunications, hi-voltage power and high-rise building construction and maintenance. Rich Rigging and Uphire have combined forces to be one of the first in Australia to place an order for the Genie SX-180 boom lift. This confirms absolute confidence in the Genie brand, the new generation XChassis design and Uphire’s determination to reach greater heights in the Sydney market. While Uphire has been established for almost three years, MD Nigel McKinley has been in the access and hire business virtually all of his working life. Today Uphire is focused on the Sydney basin, geared to an optimum fleet size of 150 units and supporting the broadest possible market. Integral to the growth of Uphire has been Rental and Sales Manager, Michael Spence. Michael commenced when the business was quite small and was the ‘go-to’ man for operations, service, parts, deliveries and hire enquiries. Now Uphire has mechanics, drivers and an apprentice on staff which leaves Michael free to focus on rental and sales, while Nigel is able to spend time with customers and also create new business opportunities. As the successor to the Genie® Z™-135 model, the new generation ZX™-135/70 boom lift has a great reputation to live up to. It comes as no surprise that this new model comes with significant improvements. The Genie ZX-135/70 boom lift makes set up time even faster than before thanks to the XChassis™ design and new angle sensors. This new model has a wider footprint with solid box section axles that pivot smoothly from 2.4 m to 5.2 m to adapt to multiple job site needs. The new self erecting jib design delivers ultimate flexibility in terms of height and reach, plus up and over clearance. Added benefits include new joystick controls for simple operation, plus high quality hoses and hard line protection throughout.